Want to improve your quality of life in an instant? Get better bed pillows. Trust us. With a pillow like the Beckham Hotel Collection Luxury Plush Gel Pillow, you’ll get deeper sleep and wake up well rested. You’ll have more energy all day long as a result, and the ripple effect will be felt in everything you do. 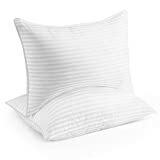 These pillows are best-sellers and they’ve been awarded a coveted Amazon’s Choice designation, which is no surprise considering how reasonable the price is. After trying these pillows for a few weeks, I would gladly pay four times that much for a 2-pack.